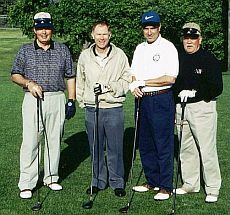 The St. Gerald Men's Golf League consists of 48 golfers divided into 8 teams. Teams are evenly drawn using player handicaps. Parity, sportsmanship and fun among the teams are paramount. League fees include 16 weeks of golf, two beer nights, a post-season field day outing with a partner, automatic weekly skins entry, flag prizes and a dinner/awards banquet. Interested golfers should watch the bulletin in the spring or contact the parish office for more information.